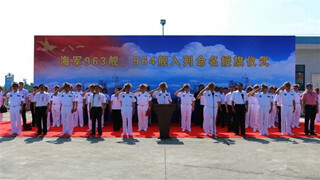 ZHANJIANG, July 15 (ChinaMil) -- The South China Sea Fleet of the Chinese PLA Navy held on July 15 a commissioning ceremony for two new comprehensive supply ships Honghu (hull number 963) and Luomahu (hull number 964) at a naval port in Zhanjiang, south China’s Guangdong Province. 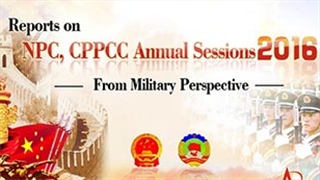 Shen Jinlong, commander of the South China Sea Fleet of the PLA Navy, presented the navy ensigns and naming certificates for the new ships. The comprehensive supply ships Honghu (hull number 963) and Luomahu (hull number 964) belong to the same class of supply ships with a full displacement of over 20, 000 tons and are new type of open-sea comprehensive supply ships developed and built by China independently. 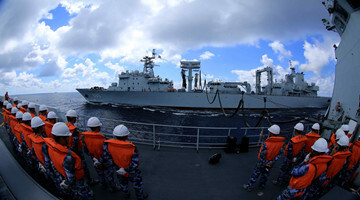 The two newly commissioned supply ships employ more advanced replenishment-at-sea technologies and can provide alongside, astern and vertical replenishment-at-sea for several different types of ships simultaneously. 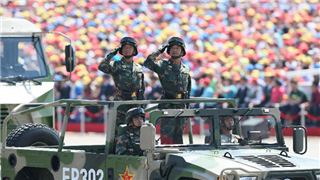 Besides stronger open-sea comprehensive supply capability, the two ships also have certain anti-surface and anti-air defense combat capabilities.